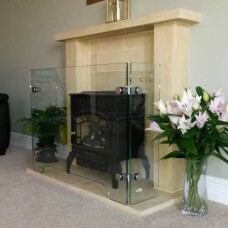 Modern and contemporary glass fireplace surrounds comprising 3 sides of real toughened glass with stainless steel connections. Each surround comes complete with cut-out handles and air vent. All our glass fire guards are made to order so please advise any specific requirements for design or size. Additional security clamps can be provided to semi-permanently fix the guard in place - particularly worth considering if small children will use the room, please ask for more information.